If you are a website owner and want your site be successful with target goals, you must be very concerned about how many visitors are on your site, how they can find your site or what they are doing on? Google Analytics is the on-of-the-top and market leader tool to monitor and analyst traffics on your website. This useful tool lets you know clearly your audience behavior, track the daily traffic, and show the weaknesses and strengthens of your site. 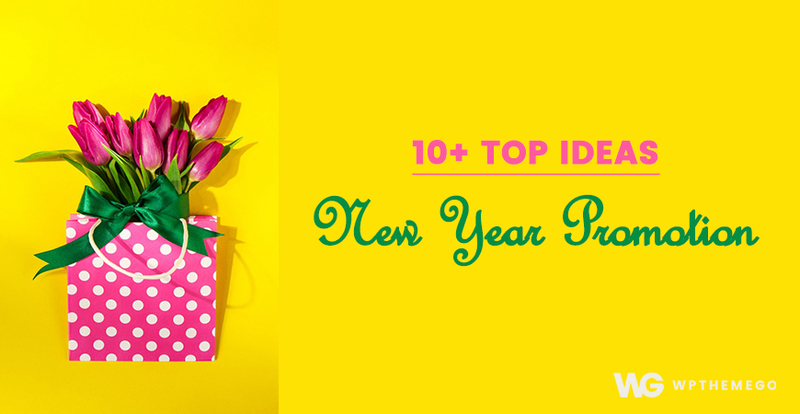 Today, we will share you some tips to install and use this powerful tool for your WordPress Site. Once your site is installed this amazing tool, you can go to the Google Analytics site to see all the statistics or have a quick look right on your site. You will know how many views your website has gained for a period of time. represent an aggregate of pageviews generated by the same user during the same session (i.e. the number of sessions during which that page was viewed one or more times). The time limit for a given session is 24hrs. 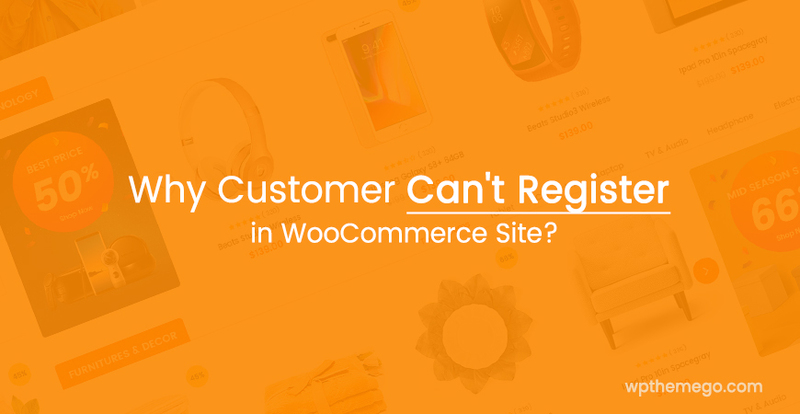 This is also an indicator into the success of your site architecture, your content and landing pages. The more time spent on site, the better it is and the greater your chance of success. With information about keywords, you can set up and manage your SEO campaign to reach more customers. Which pages and which posts are the most visited? Can you expose these pages further with SEO activity? 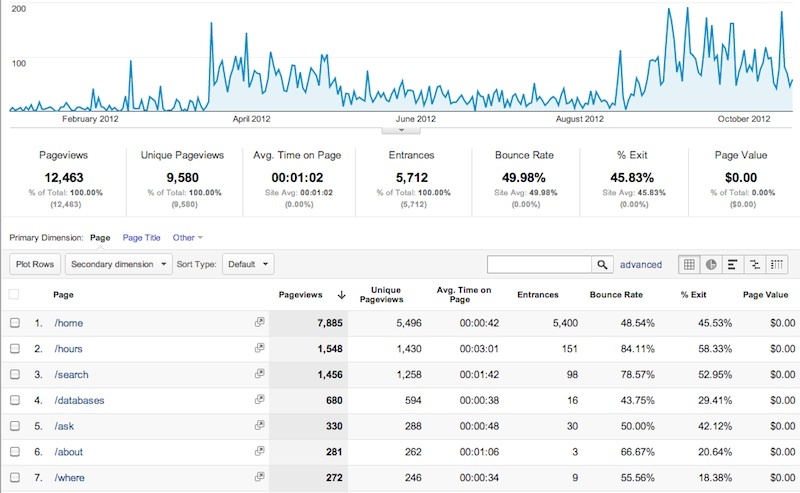 Insides the above indicates, Google Analytics provides more other data to let you know insight into your website. 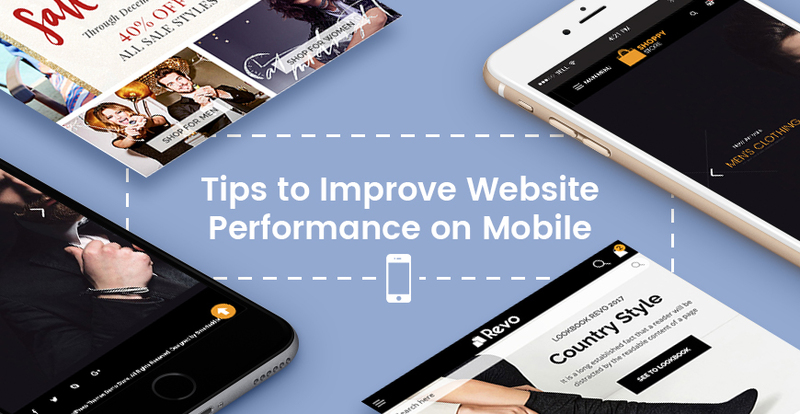 Using these analytics you stand in a better position to determine how to proceed to continue any success for your site. Google Analytics provide not only website insights, but it can also be linked with Google Adwords account. If you run a PPC campaigns, you are tottally see the results on Google Analytics. Step 1: To create a Google Analytics account >> Visit Google Analytics Signup Page and enter your Gmail account. Step 2: Once you sign-in with your Gmail account, you will be moved to the next page like the one below. 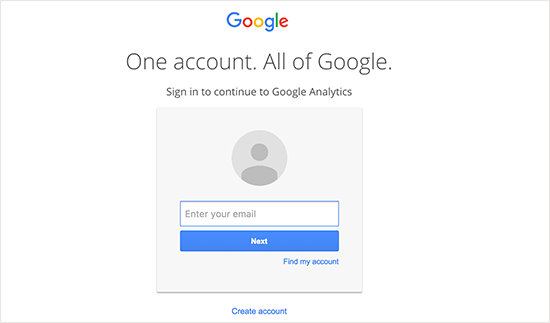 This is where you will signup for Google analytics with your Gmail account. Step 3: Fill up your information to set up a GA (Google Analytics) account. In which Account name is the GA profile name for this website, you can use your website name to make it easy to remember. 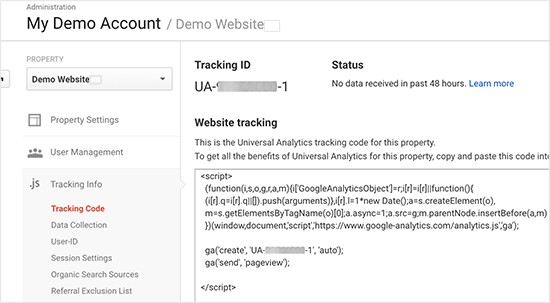 Step 4: Now you will be received your Google Analytics tracking code. You can copy this tracking code because you will need to enter it in your WordPress site depending on the method you use below. There are many different ways to setup Google Analytics in WordPress. We will show you three different methods, so you can choose the easiest method that best suits your needs. One of the most easiest way to insert Google Analytics into WordPress site is to install GA Plugins. 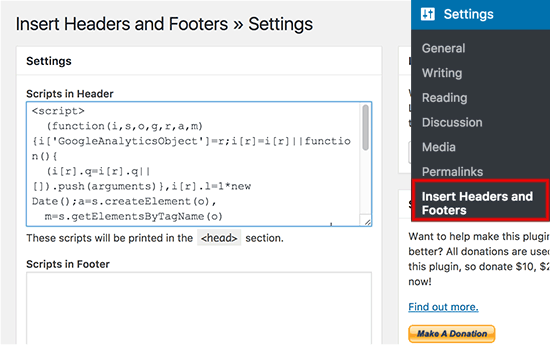 You can use MonsterInsights – it’s one of the most popular Google Analytics plugins for WordPress. Firstly, you need to do is install and activate the MonsterInsights plugin like other plugins. 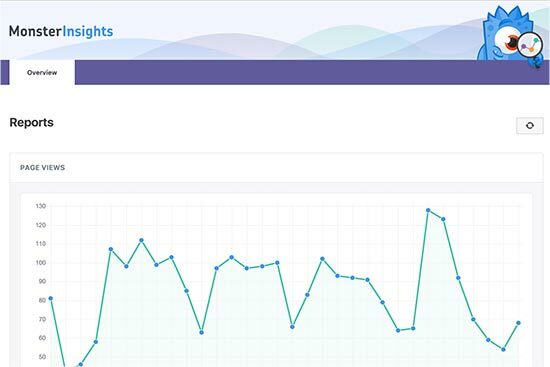 Upon activation the plugin will add a new menu item labeled ‘Insights’ to your WordPress admin menu. You go to visit Insights » Settings to configure the plugin settings. 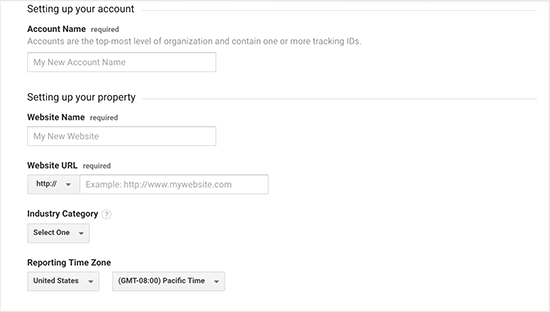 Then, you need to click on ‘Authenticate with your Google account’ button to connect Google Analytics with your WordPress site. Then you will see a popup >> Click on ‘Next’ to continue. 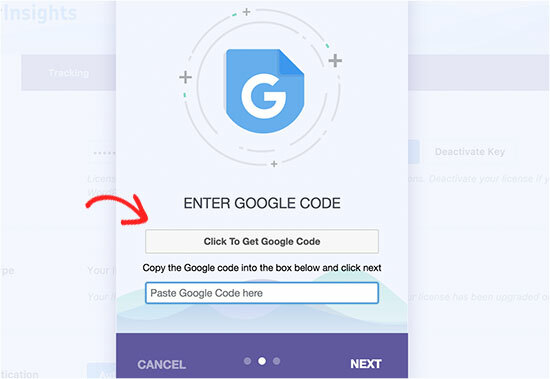 Now you need to click on ‘Click to get Google code’ button. The another popup will appear with the message ‘MonsterInsights would like access to your Google Analytics data’. Click on the ‘Allow’ button to continue. The popup will now show you a line of code which you need to copy. With this method, you need to go to the GA page to Google Analytics data, you will not be able to view statistics in your WordPress dashboard. 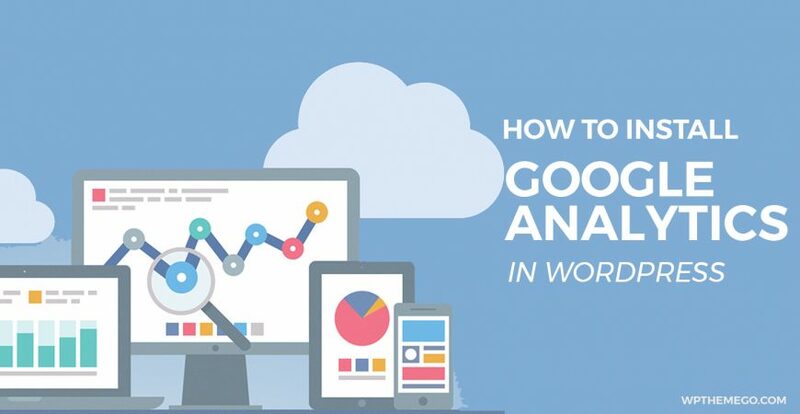 We hope this article helped you learn how to install Google Analytics in WordPress and bring you valued analytics to make important business decisions.